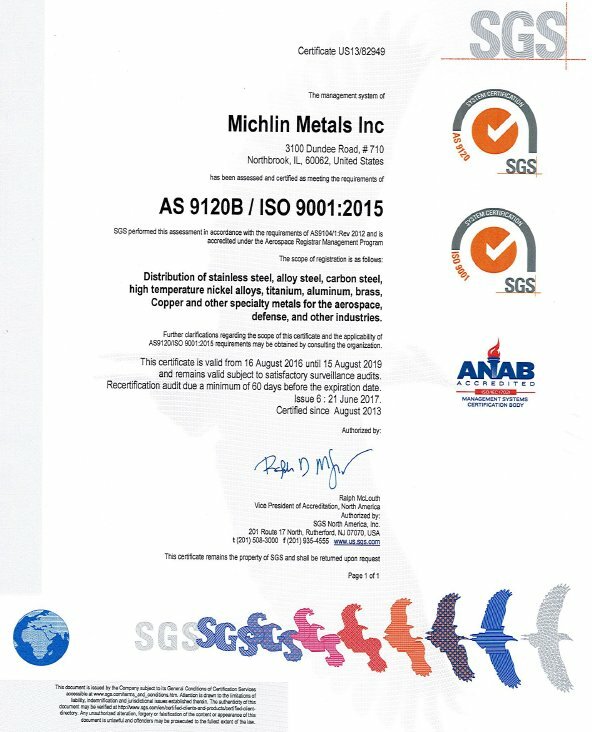 Michlin Metals is proud to announce that it has achieved AS 9120 certification. After many months of diligent work, Michlin has completed all prerequisites necessary to gain this accreditation. In order to meet the stringent requirements of Michlin Metals' aerospace customers, Michlin Metals felt it necessary to acquire AS 9120 certification. Although Michlin Metals has been compliant for years, it finally came time to pursue actual certification. As of August 16th, 2013 Michlin Metals has successfully achieved AS 9120 aerospace quality certification. For almost 30 years Michlin has serviced the Aerospace Metal and Specialty Stainless Steel Industry. As of November 2012, Michlin also became a Woman Owned Small Business. This will assist those customers who must meet government requirements through purchasing material from a woman/minority owned supplier. In addition, Michlin Metals is also registered with the government under the System for Award Management and received a CAGE (Commercial and Government Entity) Code. There are many things that Michlin offers their customers but there are no short cuts to supplying quality. Through the vast experience and knowledge of 30 years in the industry Michlin can proudly continue to service their customers in a manner that supports their operations as well as enhances their supply chain. Michlin Metals is proud to be one of only a handful of Woman Owned Small Business Stainless Steel or Metal Suppliers that can also provide certification to AS 9120. As Michlin Metals grows, the company expects to provide the same level of service and quality to all customers regardless of industry. Stay tuned, and look to Michlin Metals for any Aerospace, Stainless or other Specialty Steel needs. See the full press release here: The Michlin Metals ISO 9001:2008 & AS 9120 Certification Press Release.